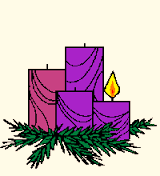 THE LORD IS COMING - The word Advent comes from the Latin Adventus, meaning "the coming" or "arrival", Arrival of whom? Jesus! Arrival when? First at his birth at Christmas and then at his second coming, at the end of times. Our readings for the next few weeks seek to prepare us for "the coming" both events, and to remind us that God's promises are always fulfilled. Our first reading from the Prophet Jeremiah (Jer 33:14-16) offers the hope and assurance that God will fulfill his promise of old, that he will raise up a just shoot from (King) David. "The days are coming, says the LORD, when I will fulfill the promise I made to the house of Israel and Judah. In those days, in that time, I will raise up for David a just shoot; he shall do what is right and just in the land. In those days Judah shall be safe and Jerusalem shall dwell secure; this is what they shall call her: 'The LORD our justice.'" In our Gospel reading (Luke 21:25-28, 34-36), Jesus instructed his disciples to prepare for and be ready for the day when he would return in glory. 'There will be signs in the sun, the moon, and the stars, and on earth nations will be in dismay, perplexed by the roaring of the sea and the waves. People will die of fright in anticipation of what is coming upon the world, for the powers of the heavens will be shaken. And then they will see the Son of Man coming in a cloud with power and great glory. But when these signs begin to happen, stand erect and raise your heads because your redemption is at hand. . . .'"
In our Epistle reading (1 Thessalonians 3:12--4:2), Saint Paul offers a prayer to God to help his beloved community increase and abound in love and to remember all that he taught them through Jesus Christ. "May the Lord make you increase and abound in love for one another and for all,just as we have for you, so as to strengthen your hearts, to be blameless in holiness before our God and Father at the coming of our Lord Jesus with all his holy ones. Amen. Finally, brothers and sisters,we earnestly ask and exhort you in the Lord Jesus that, as you received from us how you should conduct yourselves to please God and as you are conducting yourselves you do so even more. For you know what instructions we gave you through the Lord Jesus." Just as we might clean our homes before the arrival of an important guest, may we use these words of Saint Paul to help us clean our hearts and prepare for the arrival of our Lord, Jesus Christ, the Shoot of David's tree promised so long ago.